Actor Sivakarthikeyan made his production debut through Kanaa, that also saw his close friend Arunraja Kamaraj make his directorial debut. The film had Aishwarya Rajesh, Sathyaraj and Darshan in the lead roles. It performed quite well at the box office, and also garnered positive reviews from all sides. 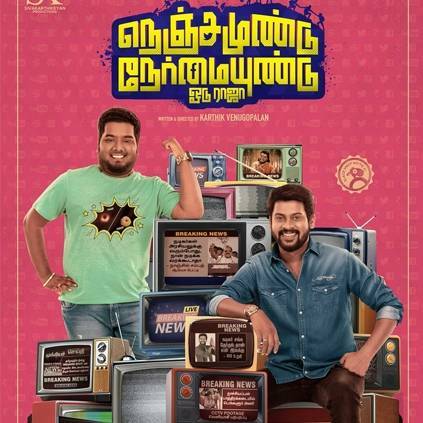 Following Kanaa, his second production is titled Nenjamundu Nermaiyundu Odu Raja, with Rio Raj as the male lead and Kanchwala Shirin as the female lead. YouTube star RJ Vigneshkanth, who was also seen in films like Meesaya Murukku, Natpe Thunai and Dev, is playing a crucial supporting role. The makers have revealed the first look of this Karthik Venugopal directorial, that has Shabir as the music director and Senthil Kumar as the cinematographer. Here is the first look that was released through by the PR team of the film. Stay tuned for more updates. People looking for online information on Karthik Venugopal, Nenjamundu Nermaiyundu Odu Raja, Rio Raj, Sivakarthikeyan, Vigneshkanth will find this news story useful.